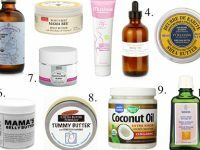 If you are concerned about stretch marks, you might be interested in an effective natural remedy that really works. This remedy is apple cider vinegar. Let’s see, how it works and how it can be used. By the way, we have already described some effective ways to get rid of stretch marks with essential oils for skin care. The recent stretch marks are white. If you do not do anything, the marks will eventually become reddish or even purple. Apple cider vinegar will 100% help you get rid of stretch marks that have appeared recently, but for reddish stretch marks, vinegar is almost useless. Natural apple cider vinegar contains useful vitamins and microelements, which have a positive effect on the skin. Usually, the result can be noticed after 2 weeks. Before using it try a simple test: rub some vinegar into the wrist and don’t wash it off the skin for 12 hours. If after this time your skin is not itchy, feel free to use apple cider vinegar! If you are pregnant and want to use vinegar, just mix it with water in 1:3 ratio. Do not use this method if you have dermatitis, rash or psoriasis. Also, it is not recommended if you have a fever or cancer. To saturate your skin with vitamins and minerals you should use a natural product. Synthetic vinegar would do you only harm. Natural apple cider vinegar is usually 6%, whereas synthetic — 9%. How to use apple cider vinegar against stretch marks? First of all heat and clean your skin. Have a warm or hot shower, using scrub or peeling for your skin. Or you can just RUB your problem areas with a towel to prepare skin for treatment. You can use apple cider vinegar wraps to get rid of cellulite and stretch marks. During the procedure, vitamins and minerals penetrate into the deeper layers of the epidermis. Fix the result by applying nourishing cream. You can do vinegar wraps only 2 -3 times a week. This method has a cooling effect and is suitable even for people with sensitive skin. How to make a compress? First, mix 50 ml of apple cider vinegar with 150 ml of water. Moisten a clean cotton cloth in the prepared vinegar solution and place the compress against your stretch marks for about 5 minutes. After that take a contrast shower, massage the problem area and apply nourishing cream. This method is an excellent alternative to salon procedures. Take 5% vinegar and cotton pads, moisten a pad in apple cider vinegar and wipe each stretch mark at least 15 times. Stretch marks should be wiped lengthwise, not across. Then have a cold shower. This procedure refreshes your skin and removes the hardened skin layers. This method acts as a complementary procedure to wraps, compresses or peeling. While having a bath, add 400 ml of vinegar to the water. Rose, orange or lavender essential oils will increase the effect. Add 5 drops of your favorite oil. One bath a week will greatly improve your skin condition. If you want to say goodbye to stretch marks massage will be a mandatory procedure. Prepare a water and vinegar solution in proportions that suit your skin type. Apply the solution to your skin, and massage the skin vigorously. The procedure takes about 7 minutes. You can do the vinegar massage every day. Apple cider vinegar is an effective way to get rid of stretch marks, especially in the early stages of their appearance. Your skin will become silky and healthy!